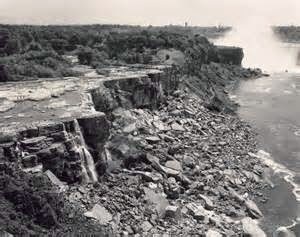 This month marks the 167th anniversary of a 30 to 40 hour period when Niagara Falls ran dry! 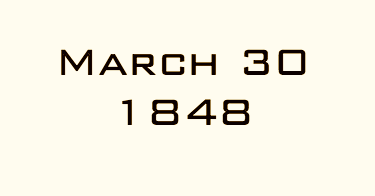 It was late on the night of March 29, 1848 when a local farmer on the New York side, Jed Porter, was out for a walk and noticed something was different. The normal sound of the thundering falls was gone! The next morning residents on both sides of the falls had gathered to witness the site; the falls had dried up over night. Factories and mills on both sides of the falls stopped work because the waterwheels used to power them couldn’t operate without water. 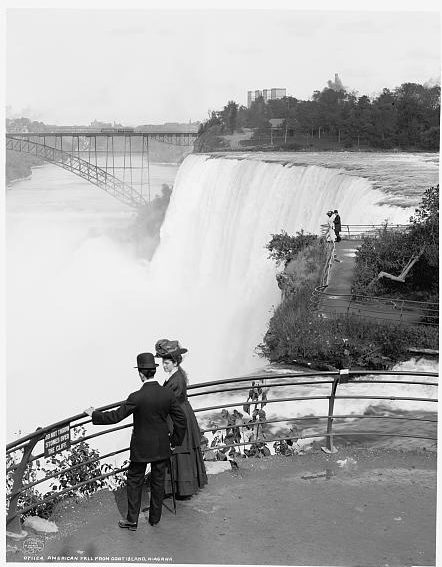 Many feared it was the end of the world; others thought the falls had finally run dry. When no one could offer a logical reason why the falls had stopped, impromptu church services sprang up on both sides of the river. The answer finally came from Buffalo, New York – gale-force winds has forced chunks of ice into the mouth of the Niagara River, between Buffalo and Fort Erie, effectively shutting off the flow of water to the falls. For all of March 30 and most of March 31, there was no water, but late on that Friday evening, after a day with temperatures in the 60s and a shift in the winds, a low rumble could be heard approaching the falls. People ran from the riverbed as torrents of water tumbled and tore through, to once again cascade over the falls with a deafening roar. The river was running again! It was the only known time that Mother Nature stopped the falls.